15% off a selection of Christmas goodies for 1 week! All products will go back to full price on Monday 3rd December, so be quick! Did you know there are just 5 weeks left to do your Christmas shopping? It’s a scary thought…especially if you haven’t dared to venture into your local shopping centre yet, but keep calm. We have a huge range of gifts for all the family that you can buy at the click of a button. Our specially selected gift sets are the perfect choice for your friends, family and pets, and each brilliant bundle will save you money. Choose from the gorgeous gift sets below or see online for our full range. Our Christmas shop is just brimming with goodies for you and your loved ones! So what better way to get into the spirit of all things spooky than with a discount on our most terrifying Halloween accessories!? From now until midnight on the 31st, we are offering you 20% on all of the items below, so you can put on a spooktacular party to be proud of. This month we are loving the colour yellow! Having launched the Eglu Cube in Yellow, and the brand new Yolk Yellow Egg Skelter, we just can’t get enough of this Springtime colour. Even the eggsperts agree that yellow is awesome, claiming that it evokes happiness, optimism and enlightenment…So why not put a spring in your step today and check out some of the lovely yellow items we have to offer! If that doesn’t have you jumping for joy then maybe this will… we have five Yolk Yellow Egg Skelters to give away this weekend. For your chance to get your mits on one you just need to tell us your favourite yellow thing and why. Post your answer on our Facebook Wall or send us a Tweet, by midnight on Sunday! With less than two weeks to go until Easter it’s time to get stocked up with gifts for the family. Although we agree that Easter eggs are yummy, we think that our range of gorgeous egg cups filled with chocolates are a much better option. With just the right amount of tasty chocolate to keep the kids happy (and not sick) and the bonus of a fun and funky egg cup to use for years to come, these make eggcellent gifts! Even better news, our Easter Egg Cups are now just £5.00 each! There are seven delightful designs to choose from and they are perfect for the whole family. Order yours today and beat the high street rush! P.S If you’re looking for something even more special this Easter why not try incubating your own eggs? Check out our great selection of Incubators to get started! It’s the 1st of December and that means the Christmas countdown has officially begun, hip hip hooray! This is a very eggciting time of the year for us all, with the promise of mince pies, christmas trees and a snowflake or two. The other bonus of December is the good old advent calendar. Don’t worry if you forgot to buy yourself one this year though, because we have an online version that you can join in with. Our first Omlet Advent Calendar is full of goodies especially for you! Each day, from now until Christmas eve, there will be a door for you to open which will lead you to a very special offer. Each offer will last only one day and there will be a range of deals to suit everyone. or Read the Daily Egg on the Omlet homepage. So don’t forget to check it out each day! But for now, and without further ado, here is today’s calendar. We hope you enjoy it! Happy Halloween everyone! Today is the day for ‘trick or treating’ so we have an eggstra special deal for you! Unfortunately we don’t have any tricks up our sleeve but we do have some treats to offer you…. This week we are offering you 15% off a selection of treats for your chickens! Calling all beekeepers!!! September is an exciting time in the beekeeping calendar as it is time to see how busy your bees have been and harvest any surplus honey. Hopefully they’ll be enough to fill a few jars and store in the cupboard for those cold, winter mornings when you need a taste of summer on your toast. September is also the time to treat your bees for varroa and start some Autumn feeding to ensure a happy hive throughout the Winter. 15% off Honey Jars, Apiguard & Liquid Feed! Bank holiday’s are great aren’t they!? A three day weekend is just what we all need to soak up the last of the summer sunshine (or rain) and enjoy ourselves. And to celebrate we thought it was only right that we run an eggstra special offer. So here’s a big hint…check your inboxes on Monday morning for your Deal of the Week email. It’s a good’un! Eggciting news for shopaholics!!! We are now accepting payments through paypal on the Omlet shop, to make your shopping eggsperience even quicker and easier. Just do your shopping in the usual way and you’ll notice the paypal option at the checkout. Why is this so great? Because the next time you’re browsing the website on your lunch break and you realise you’ve left your card at home you can still buy that emergency bag of chicken feed or that gorgeous gift that you simply must have! Hoorah! Want to give your Eglu a freshen up? Our Nettex Ready to use Sterilising Solution has just been reduced by 25% due to it having a best before date of October. It is an easy to use product that will clean your Eglu, feeders and drinkers thoroughly, killing any bacteria that may be lurking. Simply spray on, rinse off and your chickens will have a sparkling clean home again. Was £6.00, now just £4.50! Click here to buy a bottle! Thanks to everyone that entered the design-a-cupcake competition. There were lots of fabulous creations, but there could only be one winner…well, three actually, a group of friends that made a selection of weird and wonderful cupcakes. 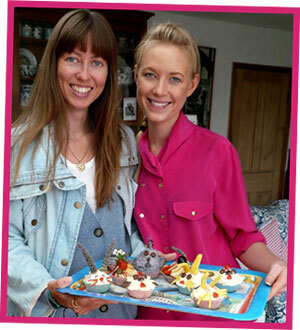 Paula, Harriet and Stacy made posh cakes covered in fruit and quirky cakes that look like animals. Great effort ladies! No, we’re not introducing a new brand of toothpaste – these ladies are smiling because they’ve won our cupcake competition! Last week we were very eggcited to hear about an article that had just been published, in the Wall Street Journal: “Putting the Chic in Chicken Coop”. The Eglu, being the most chic chicken house on the market, was featured, as was one of our lovely hen party hosts, Sara Ward. As well as keeping chickens and running courses, Sara also keeps bees, grows fruit and veg, bakes and makes cheese. An authentic domestic goddess! All of this developed after she read about the dangers of pesticides and started wondering where her food came from, and she’s not the only one, as more and more urbanites are starting to join the trend. But a trend like this calls for a trendy chicken house, and Sara recently bought her Eglu to hatch chicks. Meanwhile, we were also making the news on the BBC with the brilliant Beehaus. The news piece was all about a huge study that’s taking place all over Britain to find the best habitats for insect pollinators. Researchers at Bristol university are gathering data in 12 cities, 12 farmland habitats and 12 nature reserves around the country, making it probably the largest field study ever of pollinators and their habitats in the UK. In each location they are moving along a 1km long straight line, stopping every 10m to count the number of flowers and insects they find. It is a huge job! Although urban life has often been blamed for the decline in bee numbers, the scientists believe that the city may actually offer a much more reliable habitat, with great variety of flora and fauna. And the increase of urbanites keeping bees in their garden or rooftop is helping the population. All those Beehauses around the cities are making us proud! Read more or watch the news clip here! 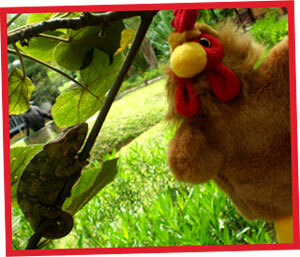 Here at Omlet HQ we’ve started a bit of a game of taking our resident chicken hand puppet on holiday with us. Rocky has been to Berlin with Andre, London with Helen and Madagascar with Quin, and he is fast becoming the most well-travelled chicken in the country. This got us thinking though, wouldn’t it be great to see more Omlet products jetting of on trips around the world!? And that’s where you come in… next time you go away, whether it’s to Blackpool or Bali, why not take your favourite Omlet item with you and send us a photo? Ok, it might not be practical to take your Eglu, but we’re thinking toys, t-shirts, egg cups or anything else you love. Send to stephanie@omlet.co.uk and we’ll feature our favourites in every newsletter. Happy holidays! We’ve heard of beef sausages, venison sausages, and sausages with stilton in them, but never before had we heard of egg sausages. That is until now, because Fiji has just produced the world’s first sausages made from egg. It all sounds very odd, but when the Ram Sami stall unveiled their first batch of egg sausages last Friday crowds were fighting their way to the booth to get a look at the new product. According to the company’s quality assurance officer the contents of the sausages are 100% egg based, held together by collagen and vacuum packed like other sausages. They have the same nutritional content as a boiled egg and they make a healthy alternative to regular pork sausages. There was a lot of interest from the public so they might well prove to be a real hit in Fiji. All we want to know is do you boil them, fry them, poach them or grill them? The USA has been hit by a heatwave recently, and last Friday a temperature of 115 degrees was recorded in Washington D.C. Now, that is hot by anyone’s standard, but is it hot enough to fry an egg on the pavement? Well, the research team at the Herald-Mail decided to find out! The team spent 35 minutes attempting to melt chocolate bars and crayons as well as trying to cook eggs, with a variable amount of success. According to eggsperts an egg needs a temperature of 158 degrees to become firm, so when they cracked their egg onto a 120 degree pavement, the yolks began to solidify, but the liquid did not turn white. Meanwhile, within half an hour the crayons had started to melt onto the pavement, and the chocolate bar became pure liquid. So, is it hot enough to cook an egg on the pavement? Apparantly not – but do let us know if you have ever managed it! 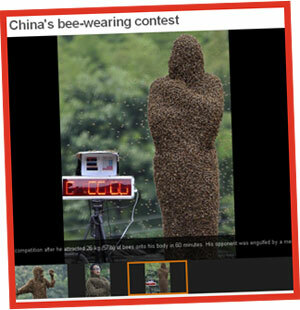 Bee-ing covered from head to toe in bees isn’t most people’s idea of fun, in fact it’s more like a nightmare, but in China people have been competing in a ‘bee-attracting’ contest. The aim of this competition: quite simply, to see who can attract the most bees onto their body. Sounds…terrifying. Wearing just a pair of shorts, and with a queen bee they reared to attract the swarms, the entrants have to stand on weighing scales and wait as they get covered in bees. Whoever gains the most amount of weight in bees is the winner, and in this case the prize went to Mr Wang, for attracting 26kg of bees in one hour. Although this sounds like an enormous amount of bees, the Guinness World Record is held by a US citizen, who attracted 39.5kg of the insects. Unbeeliveable! When Mr Wang heard that royal jelly could make his skin look younger, he couldn’t wait to hive a go! We have been adding some great new products to the website recently, and make sure you keep an eye out because there are many more to come over the next few weeks. We like to update our range of items regularly, but that means shifting some of our old residents to make room for the new. That’s great news for you though, because it means as well as having a choice of fun and funky new products to choose from, you can get your hands on some old favourites for bargain prices. Check out our latest reductions, including Cube Wind Shade for £7.00, Grow your own Patch of Carrots for £2.50, T-shirts for £6.50 and Greeting Cards from just £1.00. Beehives have been popping up all over the place over the last couple of years, with more and more people choosing to keep bees in their back garden. This is great news as it is helping to boost the dwindling bee population again. But as well as gardens and rooftops, the latest location for beehives seems to be churchyards. That’s right, in rural Norfolk a new scheme has started to introduce beekeeping to local churches. The project, called Bees of God’s Acre, is introducing bees to the churchyard and training local people to become beekeepers. After fundraising, the first five hives are now ready, and there are another 40 churches that would like to get involved. If the project proves successful it could spread across the country, and that would be great news for our bees! Last Chance to Win a Doorstop! There’s still time to enter our Doorstop Competition if you haven’t already. Here’s a reminder: to get your paws on either the fabulous feline, the brilliant birdhouse or the charming chicken doorstop just let us know which one you want and why. Email stephanie@omlet.co.uk by midnight this Sunday for your chance to win. Jim was one of the lucky winner’s of last month’s competition, bagging himself a brand new Clear Cover for his Eglu Classic. He was so delighted with his prize that he sent us some fabulous photos of the Cover in use. He has a very happy looking bunch of hens, and it’s not surprising with a swanky set-up like theirs! Interested in beekeeping, or just want something entertaining to read? Why not take a peek at Ian Douglas’ latest Beekeeping Diary entry on The Telegraph website!? In this issue Ian visits his wooden hive and Beehaus on a rainy day to find a surprising sight – both hives blocked with huge masses of bees. Although Ian fears the worst he discovers that the bees are simply ‘bearding’, meaning that the bees at the entrance are trying to regulate the temperature inside the hive. Clever little blighters! Ian’s diary is and exciting and fascinating read whether you keep bees or not, so click here to read the full story. Or if you want to catch up on his previous diary entries click here! Click here to see the range…and don’t forget it expires at midnight on Sunday. Summer is here and isn’t it brilliant!? It’s easy to get carried away with seaside trips, sunbathing and barbecues, but make sure you remember your hens at this time. Here are some top tips for Summer chicken care. It is essential that chickens have a constant supply of fresh water during the Summer as they will be particularly thirsty when it is a hot day. Our feeder drinker stand is perfect for hanging out an extra glugful of water. They should always have a shady spot that they can rest and cool down in. Our Heavy Duty Covers are ideal for this, and you can choose one that will cover the whole of the run or one that will give semi-coverage. During the Summer you may spot your hens doing more dustbathing than usual. This is just their way of freshening up and helping to get rid of any pests. Of course, when the soil is warm from the sun it is even more tempting for them to roll around in. Chickens often go broody in the Summer. You can help to prevent this by ensuring you collect their eggs regularly, but it may still occur. If your hen is broody she will try to stay in the nesting box all day. This isn’t good for the hen as she may get dehydrated if she isn’t getting up for water. Although she might get annoyed with you it is best to remove her from the nesting box to ensure she gets food, water and fresh air. If you have an Eglu you won’t need to worry about Red Mite, but for anyone with a wooden hen house make sure you watch out for these little beasties during the Summer. Hot weather brings out mite problems so make sure you inspect the house regularly, keep it nice and clean and use a good mite-kill spray inside the coop. We’ve had some cracking weather over the last week and we hear that chickens have been enjoying the sunshine just as much as us humans. Gilly emailed us to let us know how much her hens were loving the sun, and she sent a great photo of one of her gingernut rangers, Lynette, enjoying a spot of sunbathing. Gilly said the other girls, Bree, Gabi, Juanita and Celia were still hunting for the right sunbeds as Lynette had stolen the best spot. If you’ve ever been lucky enough to get a double yolker from your hens you’ll know that it can be a pretty eggciting little eggsperience. But can you image the surprise of cracking open 29 double yolkers in a row? It’s a seriously unlikely scenario but this has just happened to one woman in Manchester. Charlotte Matthews was preparing breakfast for her family when she cracked the first of her double yolkers. 12 eggs down and she couldn’t believe that each one she cracked was another double. It was at this point that Charlotte decided to start filming the eggstraordinary event, opening the rest of the box of 30 eggs . Amazingly every single egg other than number 30 was a double-yolker…and Charlotte and her family had an awful lot of scrambled egg to eat! Apparantly the odds of finding a double-yolker are just one in a thousand, so this was really impressive. Don’t believe it? Take a look at the video to see for yourselves! We had hundreds of entries to our Cover Competition, so there must be loads of you that want to get your hands on one. There could only be three winners though, and they were Michele, Jim and Sue. Hopefully we will get some photos of the covers in action soon! Don’t worry if you didn’t win this time, because we have another competition for you this month. How would you like to win one of our delightful new doorstops? You could get your paws on the fabulous feline, the brilliant birdhouse or the charming chicken. To win just email stephanie@omlet.co.uk with the doorstop of your choice and the reason you have chosen it! Competition closes Sunday 17th July. Eggciting news for Eglu owners – we have just launched a brand new range of run covers. Choose from the Heavy Duty Covers, which will protect hens from rain, wind and snow in the winter and provide shade in the summer, or the Clear Covers, which will prove just as effective against miserable weather whilst letting the light through. These covers have been designed with you in mind, following your feedback and suggestions and we hope that you are going to love them! There are 14 different covers available, in different shapes and sizes, for the Eglu Go, Classic, Cube and the Walk in Run and prices start from just £9.00. Click here to see the full range and get prepped for the Autumn! Talking of run covers, we still have a number of colourful Funshades at the reduced price of £3.00. These are selling like absolute hotcakes and we don’t eggspect them to stick around for long, so make sure you get yours now before they’re gone for good! Congratulations to Catherine Wilkinson who was the lucky winner of the Omlet Treasure Hunt. She chose to have a green Rabbit Eglu and it was delivered on Wednesday. Catherine tells us they are really pleased with it and her daughters enjoyed helping to put it together. She said their new bunny Jasper is enjoying exploring and has loads of room. Hoorah! Nicola Jones came in 2nd place and Gavin Armstrong was 3rd. Don’t worry if you didn’t win this time because you can enter this fantastic new competition! We have three of our brand new Eglu Covers to give away this month – perfect for giving your chickens or rabbits a dry run on these rainy days. To win your choice of cover just answer this easy question: How many new types of cover have we just introduced? Send your answer, along with your name and address, to stephanie@omlet.co.uk by Wednesday 22nd June, using ‘Cover Competition’ as the subject line. Good cluck! Omlet have been in magazines, newspapers, on the radio and even on the tv many times, but never before had we featured in an iPhone app…until now, that is. When we heard that Toby had designed iChicken, an app for chicken keepers, we just had to give it a try. Ichicken has all the information a chicken keeper could need, right in their pocket, making it ideal for beginners. There are sections on breeds, health, the anatomy, keeping chickens, egg trivia and droppings, with sub-sections including wing clipping, feeding your chickens and housing. Being an Eglu Classic and Cube owner himself, Toby has featured these houses at the top of the list! The app has some pretty clever features too, like the droppings identifier; as well as a gallery of different types of chicken poo, there is the option to take a photo of your own hen’s droppings to upload and compare – great for checking if there is anything you need to worry about. The most impressive thing is that Toby is only 14, and just 13 when he started designing iChicken. He started keeping chickens due to his allergy to most other conventional pets and his interest in them has grown and grown. Developing the app was a chance for him to combine his love of technology with his interest in chickens and he is continuously improving and updating the iChicken. To find out more visit this website, where you can also download the app for just £1.19. Are you crazy about your Eglu Classic? Do you love your Legbars? Does your Pirate Egg Cup take pride of place in your kitchen? Then why not show us just how much you love your Omlet products by taking a photo? Not only will we use your image on our website but we will pay you for the honour! Whichever product or breed you have just take a photo, go to the relevant page on the website and upload it using the simple form. If your image is nice and clear and it shows the product, we will display it and send you £1.00. You can upload as many photos as you like so you could make enough money to save up for an Eglu! Have a look at the customer photos on the right for inspiration! We can’t wait to see your photos! Nick and his family have some more good news too – they recently tried incubating some eggs for the first time and successfully hatched 12 healthy chicks. Click here to watch Nick’s fascinating video of one of the chicks hatching! The Limited Edition Fried Egglu is now on the shop and ready for you to buy. We’ve already sold several and with a total of just 50 available they won’t be hanging around for long. The Fried Egglu is a unique piece of design that will really stand out in your garden. With all the features of a regular Eglu, it will make a fantastic home for 2-4 chickens, keeping them safe, comfy and cosy. And, of course, you and your girls will be the henvy of all your friends. The Fried Egglu with 2m Run is just £425 – the same price as the normal Eglu, but for every one sold we will donate £20 to the Battery Hen Welfare Trust. You will also get a signed certificate with your Egglu! So what are you waiting for? Click here to get yours before they sell out! Last month we heard some eggstraordinary news from one very eggcited Eglu owner…her turkey had just laid an egg in her Eglu! Although Tinsel the turkey has her own home in a large wooden coop in the garden, she obviously decided that the Eglu looked like a nicer place to nest, and climbed right in. You’d think it would be a bit of a squeeze for a turkey… but just days later things got even stranger. Tinsel chose the Eglu as her nesting spot for laying another egg and ended up spending the night in there. She must have found it comfy because the next night she chose to cuddle up with the hens again, with no egg-scuse. Janet Unitt adopted Tinsel the turkey after she saw it wandering the streets in the lead up to Christmas. The Christmas dinner escapee was caught by a local animal shelter and Janet volunteered to rehome her. She’s settled into her new home well and she has been welcomed by Zippy, Penny and Omlet the hens…though they might start getting annoyed with her if she keeps taking up the nesting box! The kittens are safe and cosy in the Eglu for now but they will be moving to a stable when they have grown a bit more. Then it’s onto another flock of chickens! Have you kept anything unusual in your Eglu? We’d love to know, just email stephanie@omlet.co.uk. The Eglu has been in various different exhibitions since it was first designed, but we’re very eggcited about its latest location – an exhibition just for kids! The Life Science Centre, in Newcastle, opened its Under 7s Area back in February and it has been a great success. The hands on area is a fun, stimulating and safe environment where children can play, explore and learn new things. As well as the Eglu and its resident toy chicken, there is a shop, cafe, kitchen, recycling centre and a garden with a tree house, Kids can play grown-ups, growing vegetables, preparing meals, sorting the rubbish and, of course, feeding the chickens. The Eglu and chicken have proved very popular so far and we hope that these children will be the next generation of chicken keepers. The Life Science Centre is open every day until 6pm and you can find out more information by clicking here. Rabbits are the third most popular pet, with between 1.6 – 2 million pet rabbits in Britain today. With their floppy ears and fluffy tails it’s easy to see why kids and adults love bunnies, but, as with all pets, they need a lot of care and attention to be happy and healthy. With the right treatment rabbits can live for over 10 years, but unfortunately a lot of bunnies out there aren’t looked after properly. Rabbit Awareness Week takes place once a year to raise awareness of caring for bunnies. The RAW website is full of information about the needs of rabbits, including advice on diet, environment and company, and there are lots of other great things going on like free health checks with vets. RAW will be running from Monday 23rd to Friday 29th May and you can visit the website for more information. It’s not every day that we have a newsletter dedicated to rabbits (once a year, in fact), so we thought it was a good time to launch an extra special competition. 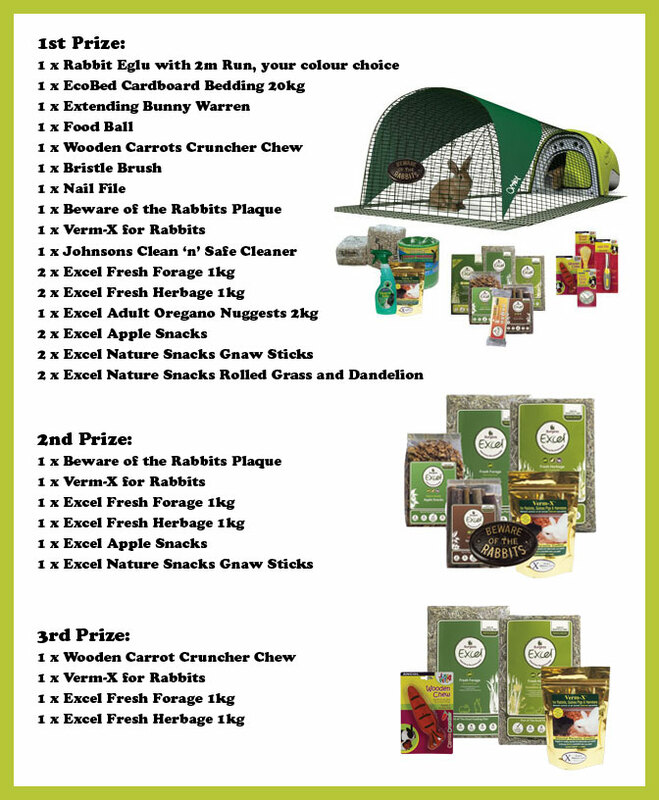 Enter our Rabbit Awareness Week Treasure Hunt and you could win a brand spanking new Rabbit Eglu, along with a month’s supply of Burgess Excel food and some other rabbit goodies, worth a grand total of over £500! How do you win this wonderful prize, we hear you cry…it’s simple. Over the next week you will need to visit different pages to pick up our secret passwords. There will be one password to collect at 10am on each day of RAW, and you will need to pick up each one to find the clue to the next one. Once you have collected all five passwords you just need to send them along with your name, address and phone number, to stephanie@omlet.co.uk. If you missed a day don’t panic, because the passwords will all remain in their secret spots until Sunday 29th May. You have until midnight on the 29th to send in your entries. The winner will be chosen at random, and there are two runner-up prizes up for grabs too. You’ll find your first clue and password on our Facebook page, on Monday. Don’t worry if you don’t have a Facebook account because you can still view the page without one. Good luck! Click here to see full details of the prizes! Last year we told you about the world’s largest rabbit, so this year we thought we’d visit the other end of the spectrum…The world’s smallest rabbit is the Columbia Basin Pygmy Rabbit, found in a single area in Washington. Pygmy rabbits are also one of the rarest breeds of rabbit, being declared extinct in the wild in the 90s, after the remaining 14 bunnies were taken into protection. No one was successful in breeding this species in captivity, until 2001, when the Washington Department of Fish and Wildlife asked the Oregon Zoo to help. Since then the zoo has bred over 70 baby pygmy bunnies and they paint the ears in different colour patterns to tell them apart. The Columbia Basin Pygmy Rabbit is tiny, weighing less than a pound when fully grown, and it will easily fit into the palm of your hand. Now, compare that to last year’s featured bunny Darius, at 3 stone 7 pounds, and you can imagine the size difference! “Rabbits need two kids of fibre in their diet; digestible and indigestible. The first gives them essential nutrients and the second keeps their digestive system moving effectively. Now for the science bit… Indigestible fibre passes through their digestive system and is excreted as separate, round hard droppings. This process keeps the digestive system moving and stimulates the appetite. Digestible fibre is moved up into an organ called the caecum – this is like a giant appendix. Good bacteria in the caecum ferment the fibre (making it easy to digest) which then emerges in the form of clumps of sticky droppings called caecotrophs. Rabbits then re-eat the caecotrophs and their systems extract essential nutrition as the digestible fibre passes through for a second time. There are loads of good rabbit food available that are designed to give your pets the fibre and nutrients they need, but one ideal option is the Burgess Excel Feeding Plan. You can read the plan and buy the food by visiting the website. Burgess Excel are offering Omlet members money off coupons for Herbage/Forage and Nature Snacks. Simply print out these vouchers and redeem at any good pet food retailer. And don’t forget you can win some brilliant Burgess food in this month’s mega competition! Now to a couple who really appreciate rabbits. Husband and wife team Steve Lubanski and Candace Frazee love bunnies so much that they have over 28,000 of them (that’s toy bunnies, not real). As of March 25th this year they officially set the world record for the largest collection of bunny rabbits, with a grand total of 28,423, to be exact. Their collection is so big that the couple have opened their own Bunny Museum, in their home, in California, which they call ‘the hoppiest place in the world’. It’s free to visit, and it must be the only museum that’s open 365 days of the year! If you fancy taking a visit to see their terrific collection you are encouraged to take some fresh fruit and veg with you, for their seven real pet bunnies. Don’t take carrots though – they’re fed up with them! Fancy getting your mits on an eggtastic prize? This week you can win three of our top selling egg products; ‘Eggs’ book by Michel Roux, an Egg Skelter in the colour of your choice, and your choice of novelty egg cup. This prize is worth almost £35 and all you need to do to win it is send us your best chicken or egg jokes. Just email your joke to stephanie@omlet.co.uk, with ‘Joke Competition’ as the subject line. If it cracks us up you’re onto a winner! We know we’ve forgotten the kids recently, so this week there’s a special competition for them too! Send us your jokes about creepy crawlies and you could win a Big Bug Magnifier, Earthworm Nursery and Living Twig Kit. The subject line for your emails should be ‘Kids Joke Competition’. You have until Sunday 15th to enter so good luck! There were loads of entries to our Easter Competition of ‘guess the number of eggs in the flower pot’, and several people were clever enough to guess the correct number of eggs as 30. We could only choose one winner though, and the lucky lady was Catriona Heeraman. She wins 12m of the New Omlet Chicken Netting. She’s thrilled to have won and we hear her girls are really looking forward to getting there home eggstended! Meanwhile, in Germany, the Beehaus has appeared in magazine called Garten! Trends – that’s Garden Trends to you and me. The rather stylish glossy mag has a Honeymoon feature, with accessories for busy bees and beekeepers, including the yellow Beehaus. It’s good to see other countries picking up on the beekeeping trend! Easter might be over but we just couldn’t resist sharing this seasonal story with you… One couple in Ohio created a cracking Easter display in their garden, using none other than broken egg shells. They spent weeks preparing for the display, designing it carefully and painting every eggshell. And can you believe there were more than 30,000 of them!? How eggstraordinary! The Manolios have been creating eggshell displays every Easter since 1957 so they are very eggsperienced, but this one was bigger and better than ever before. The display featured a huge cross, cartoon characters and the word ‘Eggshelland’, and apparantly the kids love it. They have had to work hard though, visiting a local restaurant every morning between Thanksgiving and Easter to collect eggshells. You may have heard of the Battery Hen Welfare Trust. They are a charity that re-home ex-battery hens, giving them a second chance at a happy life. Many Eglu owners have chosen to re-home ex-batts in the past, and now one very special family has just re-homed the 250,000th. To celebrate reaching the milestone of quarter of a million, BHWT held a special event at the charity’s headquarters in Devon, with loads of press, supporters and volunteers. There were lots of families looking to keep chickens and the Dawsons chose the 250,000th hen. They then got a brilliant surprise when they were presented with the first limited edition ‘Fried Egglu’ from Omlet. The chicken has been named Kate, in the spirit of the Royal Wedding, and we think the Eglu really is fit for a princess! Feeling rather henvious of the Dawson family? Well, you might be interested to know that we have 49 more of the Fried Egglus at Omlet HQ, and they will be available to buy shortly. Omlet will be donating £20 from each Fried Egglu to the BHWT. Keep an eye on the website for more information. If you can’t wait email stephanie@omlet.co.uk. You might remember that a couple of years ago two of our chickens starred in a play in London. Jerusalem was a funny and hentertaining play based around the rural life and was shown at the Royal Court Theatre throughout the Summer. Well, we thought we’d heard the last of that, but eggciting news just in…Jerusalem has now made it to Broadway! Jez Butterworth originally wrote the play in New York, so although the play is about life in England, he thought it was only natural to bring Jerusalem back to where it was born. And we’re so glad he did, because our girls are becoming the biggest hens in showbiz! And as if things couldn’t get any better, the play has just been nominated for six 2011 Tony Awards. The chickens are bigger than Barbara Streisand! Jerusalem is showing at the Music Box Theatre until the end of July. We are still waiting for our comp tickets as guests of the chickens but let us know if you go. To find out more or to order tickets visit the website! Easter is here again already and it’s set to be a scorcher – quite eggstraordinary as it’s only April. We’re not complaining though, in fact we’re lighting up the barbie here at Omlet HQ to make the most of the sun. Chickens will be loving the sunshine and it’s perfect weather for a dustbath. Bees are busy flying and it looks like it will be a bumper year for honey production. Oh, and most of us get a four day weekend. Hooray! If you’re not eggcited enough already, this newsletter should put a spring in your step…so let’s crack on shall we!? Win 12m of New Omlet Chicken Netting! 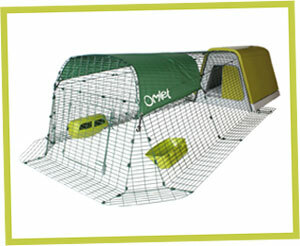 How would you like to get your hands on some of the New Omlet Chicken Netting? It’s easy! All you need to do is guess how many eggs there are in the flowerpot. Send your number to stephanie@omlet.co.uk with ‘Easter Competition’ as the subject line. The winner will receive 12m of the netting, worth £69.00! Only one entry will be allowed per person, and the winner will be randomly selected from the correct entries. Competition closes on Sunday 31st April so you’ve got plenty of time to carefully calculate your answer! Happy guessing! This month we heard an unbelievable story, from John and Lynne Biggins, that we just had to share with you. “As I pulled off the M1 motorway and up the slip road I glanced across at the lorry by my side, and could not believe my eyes. Sitting between the cab and the trailer was a little brown hen. I took a photo with my mobile, because no one would believe me; but what to do? I pulled across and flagged down the lorry to inform the driver. He was not too pleased initially until he saw for himself. He then told me he had just come from a farm but that was two hours ago and he had been on the road for 100 miles. Are you a fan of Omlet products? Want to start earning a bit of eggstra money? Then you are going to love our latest feature to the website. You can now get paid for uploading photos of our products. That’s right, take a photo of yourself using something you’ve bought from Omlet, upload it on the website, and if it’s good we will pay you £1.00! If you take lots of photos you could really start to build up a nice little nest egg. Stuck for ideas? How about a nice image of you modelling a pair of oven gloves, baking with the cupcake cases or filling up a grub? Or simply take a snap of your Eglu and chickens in this lovely sunny weather. To upload your image just find the product on the website and you’ll see the link! We had loads of entries to our annual Caption Competition, with some seriously creative one-liners, and the Caption King is now feeling slightly threatened as a result. There could only be one winner though, and the £20 Omlet voucher has been awarded to Ann Jones. You’ll see her winning caption on the right! Commendations also go to John Caddy for his entry “Open wide and we’ll get on with the eggxtraction!” and Micky Brophy’s “The Things a girl has to kiss to find a prince?”. We can now also reveal the winners of the highly popular Teapigs competition. The first lucky name to be drawn was Allison Millgate, who wins the cracking hamper of various Teapigs and a teapot and mug to drink them with. Amanda Spalding was our runner-up and she wins the sample selection of teas. As if Easter wasn’t sickening enough with all that chocolate, one chip shop owner in Yorkshire has come up with a treat that combines chocolate, sugar and a whole lot of grease…the deep-fried crème egg! After the success of his deep-fried mince pies at Christmas, chippy owner Martyn Bilby decided to try this as an Easter special, saying “I will try anything”. And they have already proved to be pretty popular. According to Martyn “People turn their noses up at first, but once they try them they eat their words and agree that they are really tasty”. It’s all for a good cause too! He is planning to donate all proceeds from the deep-fried crème eggs to charity, so if you find yourself in Doncaster over the Easter break, why not try one? And make sure you tell us what you think! It’s April, hoorah, and boy are we happy about it. Reasons why we love April: Winter has gone and the sun is actually shining, the days are getting longer and brighter, chickens are laying eggs like there’s no tomorrow, bees are flying around for food, kids get two weeks off school, adults get three bank holidays, there’s a great eggscuse to eat lots of chocolate and our Prince is marrying his Princess! There’s loads to celebrate so here’s an eggstra special newsletter to kick things off. Enjoy! There’s nothing more British than a nice cup of tea, and seeing as we are feeling eggstremely patriotic this month with the royal wedding upon us we have decided to team up with Teapigs to run a right royal competition for you. In case you haven’t heard of them, Teapigs is a specialist tea company that’s on a mission to get UK drinkers to “drink real tea”. That means quality whole leaf, not the dusty stuff found in most of the nation’s paper teabags. They have a huge range of flavours available and they have put together two great packages that will take pride of place at any royal wedding tea party! We have one main prize worth £45, containing a teapot, mug and five packs of Teapigs, and a runner up prize worth £12, containing 12 mini packs of Teapigs. For your chance to win a tea-riffic prize just email your name and address to stephanie@omlet.co.uk, with ‘Teapigs Competition’ as the subject line. The competition closes at midnight on Sunday 17th April so we’ll have plenty to time to send your tea before the big day. Good luck! This year’s Caption Competition is in full flow and we’ve had some cracking entries flying in already. There’s still time to have a go though, so if you haven’t entered yet don’t panic. All you need to do is come up with a comedy one-liner for this brilliant photo of Emily and her Pekin Maisy. It’s a great shot and we’re sure you can think of something clever. Send your creative caption to stephanie@omlet.co.uk by Sunday 17th April and you could win a £20 voucher to spend in the Omlet shop. Show season has begun and we are very eggcited about being at the Grow Your Own Show next month. It will be a fun day out for all the family, with areas on gardening, organic farming, pig and poultry keeping and cooking – great for anyone interested in home grown produce. Thought gardening was complicated? Think again, gardening experts the Michauds will show you the easy peasy way to gardening, demonstrating how to create a container garden, that will provide fresh food for weeks, in just 30 minutes. They will give you and your kids the encouragement to start growing your own. TV and radio guru Pippa Greenwood will also be there giving her top tips on producing tasty, home-grown vegetables. And when you’ve learned how to grow your own produce, watch Rachel Green demonstrate how to turn it into culinary delights. Her cookery theatre will inspire you to try it yourself! Poultry expert and writer Francine Raymond will be there to answer all your questions about keeping chickens, and she certainly knows a thing or two on the subject. Francine is the author of two of our best-selling books: ‘The Big Book of Garden Hens’ and ‘Keeping a Few Hens in your Garden’. And if you fancy keeping pigs instead you can have a chat with Michaela Giles, a real expert in the area. We will also be there, with the Eglu on display, so you can come and check out the coolest accomodation available for chickens. The show will be in Losely Park, Guildford, from Sunday 1st – Monday 2nd May and you can buy tickets on the website. We are pleased to announce the results of the Eggstreme Pancake Flipping Competition 2011…drum roll please… the winner, with a large majority of the votes, and a seriously extreme attempt at flipping pancakes, is Eddie Krish. Unicyling is impressive enough, but to toss a pancake while sitting that high up, keeping balance, moving and avoiding pedestrians – wow! Whether the pancake ended up back in the pan is another matter. Eddie wins a year’s supply of Omlet chicken food for his efforts, and we’re sure the hens will be happy with that. And if you want to beat him next year you ‘batter’ start practising now! See more of Eddie later in the newsletter, as he also stars as our Eglu Owner of the Month. Since joining Facebook last year we now over over 1,000 followers, which is great! If you haven’t joined our group yet why not take a look? It’s a good place to meet other chicken keepers, show off your first egg photos, get advice on hens and find out about upcoming events. You’ll also find links to our newsletters, details of special offers and secret voucher codes. If you’re more into tweeting than Facebook updates you can follow us on there too! Just click here to be taken to our site. The pancakes have been flipped, the photos have been sent in, and now it’s down to you to decide the winner of our Eggstreme Pancake Flipping Competition 2011! We have whittled it down to three entries (unfortunately none of which are from Omlet HQ – we just weren’t good enough!) and we think all of them are fantastic, but there can only be one winner. So if you want to help decide who deserves to win a year’s supply of chicken feed, just click on the image on the right to be taken to the three photos, then simply email stephanie@omlet.co.uk with either ‘Motorbikes’, ‘Trampoline’ or ‘Unicycle’ as the subject line. Voting will be closed at midnight on Friday 1st April. Time for another competition and this time you could win a £20 voucher to spend in the Omlet shop. It doesn’t require anything extreme, just a bit of thought using the old noggin. You see our King of Captions is on holiday at the moment, so this brilliant photo has been left with no comedy one-liner. Emily and her Pekin Maisy deserve a cracking caption so it’s over to you to help. And we’ve got no worries because year after year you have demonstrated your ways with words! So for your chance to win just send your caption to stephanie@omlet.co.uk by Sunday 17th April. Good luck! Lady Gaga Loves Her Eggs! It looks like Lady Gaga has gone a little bit more gaga this week, having ordered a giant egg. No, we’re not talking about the egg she sang in at the Grammy’s, though that was slightly odd, she has just taken her appreciation for eggs to a whole new level by ordering an egg bed to sleep in. The singer is in the middle of a very eggspensive renovation of her New York home, and she is having a giant padded egg especially made for her to sleep in. So, why the egg obsession? Apparantly she felt very comfortable and at peace in the stage egg, spending hours meditating inside. If this craze catches on we know what Omlet’s next project will be! Easter time is great! There are daffodils everywhere, little lambs in the fields and lots of chocolate to be eaten…but can you imagine having some fluffy chicks hopping around too? You can’t get more seasonal than that! If you have been thinking about hatching chicks now could be just the right time to start, because you really could have them in time for Easter. Chicken eggs take eggsactly 21 days to hatch from the date they are started incubating, so if you start this week you could have the best Easter gift ever! If you want to give incubation a go there is a great guide on the forum for hatching and rearing chicks. Click here – it’s well worth a read! We have a great range of incubators and other incubation and chick rearing equipment available in the shop to help you every step of the way. Click here to see the range. And remember, if you do have success with hatching chicks, please send us a photo – we love going gooey in the office! Got any plans for this weekend? Why not take a trip to the Ideal Home Show in London? Perfect for a lavish lunch, a spot of shopping and a beauty treatment or two. (We hear there’s even a stand where you can get your feet nibbled by fish.) Get inspiration for your home and garden and come and see the Eglu and Beehaus in the flesh – it might be just what you’re after to bring life and colour to your outdoor space. This year we’ve got a great selection of our small shop items on sale too, so you might just pick up that quirky gift you were hunting for, or a little something special for yourself. You could even refresh your egg cup collection just in time for Easter! The show finishes this Sunday so if you want to book tickets or find out more visit the website! The weekend has almost arrived, hooray, and if you haven’t got any plans why not come and visit us at the Ideal Home Show in London? We will be there until March 27th with the Eglus and Beehaus on display, as well as a range of gifts and homeware for you to buy. It’s a great chance for you to see our products in the flesh and come and have a chat! See you there! We hope you all had a fliptastic Pancake Day and had fun stuffing yourselves silly. We haven’t had much evidence of extreme pancake flipping yet though, and time is running out. If you forgot to take photos for our competition it is the perfect eggscuse to make yet another batch and flip up a storm, and if you just haven’t sent us your pics yet get a wriggle on because there is a great prize up for grabs. Yes, you could win a year’s supply of food for your hens! That’s 10 bags of 10kg Organic Omlet Chicken Feed, enough to feed two chickens for a year, to have delivered whenever you choose. Factor in the delivery cost and that’s a prize worth a whopping £137.50! So why not give it a go? Just send a photo of your extreme pancake flipping to stephanie@omlet.co.uk. Entries need to be in by Monday 14th so you can spend the weekend perfecting your pancake poses! This week PC Advisor magazine has published a review of a brand new game for the iPhone, called Egg vs Chicken… and although we wouldn’t usually comment on all this modern technology stuff, we just had to give this a mention to our newsletter readers. After all, for any iPhone users out there, this might be the most eggciting bit of news you’ve had all week! Egg vs Chicken may be the new Angry Birds of the iPhone gaming world. The new puzzle action game features a pen full of eggs and a lot of crazy chickens. The aim of the game is simply to defend the eggs from the chickens by shooting the chickens with the eggs until they disappear. According to the game testing eggspert it is a ‘highly impressive game’, and we think that anyone that keeps chickens will appreciate it even more! With Pancake Day out of the way we can officially start getting eggcited about Easter now! That’s why we have just put lots of gorgeous new Easter gifts on the website. Yes, we could have gone all supermarkety and filled our shelves with chocolate as soon as Christmas day had gone, but we thought we might get sick of the sight of it by April. So what does our Easter selection have to offer? Lovely little egg cups filled with chocolates, bags and jars full of speckled eggs and delightful decorations for the table. They’re cheap, cheerful and far prettier than the basic boxed eggs you’d find on the high street. So with just six weeks to go, why not take a peek? The Eglu often gets ‘papped’ for different magazines and papers in the UK, but it’s pretty cool when we spot it in a publication overseas. This month the American magazine Urban Farm has a whole article on chicken housing, called Coop Sweet Coop (brilliant!). It features the Eglu Go, in bright yellow, saying “pre-fab coops, like the Eglu, are an easy answer to low-maintenace chicken housing”. Although there is information on all sorts of chicken coops the advice is: “Pre-fab coops are the simplest way to go. They arrive in a box, ready to be set in your yard and welcome chickens.” Considering the article was written by an author of two best-selling books on poultry, Christine Heinrichs, we take her comments as praise indeed! Apparantly there is such a thing as Coops Tours in America, where residents interested in keeping chickens can take a tour of different chicken coops in the area, to see what the options are. This is something to start in the UK, surely!? Feed your Chickens Free for a Year! We don’t like to blow our own trumpet but here at Omlet HQ we think we are pretty amazing at flipping pancakes. We have a hen-load of eggsperience and enough eggs to practise every day. We are so confident of our skills, in fact, that we challenge you to take us on in an Extreme Pancake Flipping Contest! Our annual pancake flipping competition has become a tradition but up until now no Omlet employees, friends or family have been permitted to enter. It’s a crime wasting our skills like that, which is why this year we are allowing ourselves to enter too…and we bet you we’re going to win! The prize up for grabs is 10 bags of 10kg Organic Omlet Chicken Feed, enough to feed two chickens for a year. To make sure things are fair we will post the top 10 pictures anonymously on the newsletter and let you judge on who’s the winner! This is extreme pancake flipping, so we want to see pancakes launched high into the sky, flipped under water and tossed in synchronisation. So do you think you can beat us? Send your photos to stephanie@omlet.co.uk by Monday 14th March. The challenge is on! Roll up, roll up, get your royal wedding mugs! There’s just two months to go until Will and Kate tie the knot and even though every woman in the country is wishing it was them marrying the prince, we think it’s still worth celebrating…after all, we get an extra day off work thanks to them! It’s not every day a member of the royal family walks down the aisle and this day will be something to remember, so we are proud to be selling a small range of momento mugs to mark the occasion. There are three designs available and they all come complete with a Union Jack gift box, making them great to give as a gift, or to keep for yourself. Not convinced? Take a peek and you might be surprised! choice for enjoying a boiled egg in the morning! And boiled eggs are brilliant – the perfect breakfast for mothers-to-be and tots, in fact. According to the magazine, eggs contain nutrients that are essential for expectant mothers. They are full of vitamins, protein and nutrients, including choline which is good for brain development in unborn children. The iron is also good for combating anaemia in pregnancy. So that’s good news all round! Farmyard Layers Pellets – good for strong eggshells and good yolk colour. Organic Grow Pellets – to support steady growth in young poultry. Organic Starter Crumbs – for feeding chicks up until 5 weeks old. Chick Crumbs with Coccidiostat – to prevent Coccidiosis in growing chicks. Thanks to everyone that entered our photo competition. We received some brilliant pictures that brightened up our days…and without further ado, here are the results: 3rd place goes to proud grandma Tina with a colourful photo of a Mark 1 Eglu and her four favourite girls. In 2nd place is a perfect picture of Dorothy the hen with her two babies Lizzie and Lulu. Elizabeth uses the Eglu as a maternity wing while her other girls stay in a Cube. The winning photo is from seven year old Mikhaela, posing perfectly with her pink Eglu Cube. Top marks for colour coordination! Valentine’s Day is upon us once again and it’s not just people that are feeling romantic…it’s chickens too! Anne Morrow proved this with a photo of her cockerels sharing a tasty meal of corn. It’s clear that this pair are good friends and we think it’s a brilliant snapshot! As Barbara mentions later in the newsletter, chickens usually get back to their full laying routine around Valentine’s so it’s a good time for everyone. It shows us that Spring is starting to Spring and we can look forward to brighter mornings and lighter evenings. LOVE-PINK-2011 … Perfect for treating the love of your life to that Eglu or Cube they’ve always desired! We are proud to present to you our latest product, the Omlet Screw Pegs… 2011’s must-have Eglu accessory. Omlet Screw Pegs screw the Eglu run into the ground making it extremely difficult for anything (eg. a fox with a crowbar) to lift it. Each peg has an inbuilt handle making them very easy to use and this pack comes with a drill adaptor for even quicker attachment. To make sure you don’t lose the adaptor, it simply twists into place in your Eglu’s run mesh, so you’ll always know where it is. Not a fan of chickens but keen on camping? Whether it’s holiday camps or festivals, the Omlet Screw Pegs will make a great change to normal tent pegs. They’re easier to screw in, they’ll ensure your tent is firmly secured to the ground and they look pretty cool too! Could this be the best chicken netting in the world? We think so, and the reason it’s so good is down of you! You see, we love getting feedback from our customers and we try to take on board any comments and suggestions you have. It is down to your feedback that we have come up with a new and improved version of the chicken netting. So what makes it different from other nettings? Firstly, the poles have two spikes in the end, making it easy to tread them into the ground. Second, all netting comes with a gate, allowing easy access into the area, without having to hurdle! Finally, at 125cm high it is taller than most nettings on the market, making it tricky for flighty hens to escape. The netting is available in three sizes – 12 metres, 21 metres or 42 metres. Whichever size you choose, it will come in a handy roll and it is easy to put up and move around. The holes in the bottom half are smaller, so that it is suitable to use for birds such as bantams. The brand new Chicken Netting arrived at our HQ just a few days ago and is already selling like hotcakes, so be quick! Help us Beat a Record! Fancy a bit of a challenge? How about trying to set the world record for the highest drop of an egg without it breaking!? The Guinness World Record Egg Challenge Set contains everything you will need to attempt the record, including a booklet with instructions on how to build parachutes and other structures for your egg, and all the materials you will need to put your plan into progress. This fun gift set got us thinking though….as well as trying to set your own records at home, wouldn’t it be fun to set a record together!? With so many chicken keepers out there we are sure that we could team up to do something amazing! But we need your ideas. Some group records have included ‘most eggs balanced by a group’ (1,972), ‘largest scrambled eggs’ (1,240kg) and ‘largest egg and spoon race’ (1,277 people). If you’ve got an idea of something we could crack email stephanie@omlet.co.uk and we’ll have a vote on it! There’s still time to enter our latest competition if you haven’t done already! It will wipe away your Winter blues, get us smiling in the office and you could win a £20 voucher for your efforts, so what’s stopping you? Our photo competition is easy to enter…just strike a pose in front of your Eglu and get someone to take a snap. We want to see smiling faces, colourful coops and chirpy chickens! Send your photos to stephanie@omlet.co.uk by Sunday 20th February for your chance to win! With just a few days left of January we are hoping that we have seen the last of the snow chickens for now. Real hens will soon start laying fully again and the beekeeping season is almost upon us, but for now here’s another newsletter to add to your Friday feeling! We receive some great customer reviews of our products and from time to time we find one that really stands out. This has to be our most puntastic review ever and we think Edward would be the perfect candidate for a job at Omlet! “I’m no YOKer but I’m not EGGSactly an EGGspert in customer care but nevertheless I must say the service I received from Omlet UK was EGGcellent,I’m sure my family will be EGGstatic when they receive their gifts. It bEGGar’s belief that people would shop anywhere else as Omlet UK certainly isn’t home to any BootlEGGs. Anyway I will enjoy my weekend listening to rEGGae music whilst riding around on my sEGGway. .
Great news! Our range of chicken health products is eggspanding! Having listenened to your requests we have now introduced lots of new products, including Aubiose Bedding, Orego-Stim Complete, Barrier Anti-Pecking Spray and Nettex Tonic with Seaweed, as well as lots of new lice and mite treatments, vitamin supplements and housing disinfectants. Keep an eye on our website over the next few weeks for more new items. We want to become your one-stop-shop for all your chicken keeping needs, so if there is anything you would like to see in our shop please let us know and we’ll see what we can do! Just email stephanie@omlet.co.uk. Does anyone else feel like January is dragging on forever? It’s cold, it’s gloomy and we don’t get another bank holiday until April, disaster! We all need a bit of cheering up and we’re hoping that you can help us out. We want you to send in your photos of your colourful Eglus, your chirpy chickens and your beautiful selves to brighten up our dull Winter. Pose with your purple Cubes, eggsibit your finest eggs and say cheese with your chickens. We will put together a gallery of your fabulous photos and our top three will win vouchers to spend in the online shop. Send your photos to stephanie@omlet.co.uk by Sunday 20th February. Good luck! In case you had forgotten Valentine’s Day is in just over two weeks. The shops are full of teddy bears, chocolates and roses, but if you are looking for a gift with a bit of a difference why not have a quick peak at our Valentine’s section!? You’ll see a few of the fun and funky items on offer at the bottom of this newsletter, but there are lots of other unusual ideas to choose from. Although Easter is more our thing, we are feeling just a wee bit soppy and this year we would like to know your romantic stories. Did you meet the love of your life on a chicken keeping course? Did someone win you over with a dish of poached eggs? Did you put an Eglu and chickens on your wedding gift list? Whatever your story let us know. We are also on the look out for a special couple to feature as our Valentine special’s Eglu Owner of the Month so if you are interested please email stephanie@omlet.co.uk. Happy New Year! We know it’s a bit late but we needed a bit of a break after all the eggcitement of the 12 offers of Christmas. The good news is that those promotions were so popular we have decided to introduce a ‘Deal of the Week’ for the rest of 2011. You will be able to find out the details of these on our website and in your inboxes every week so keep an eye out – there will be some cracking offers! Thank you Pauline – perhaps that’ll be a new product to look into! We launched our amazing Wooden Pet House Trade-In scheme at the end of 2010 and we have already had a fantastic response. It seems that there are quite a number of people with ‘orrible wooden houses and many came out of the closet when we introduced our tempting offer. It’s not hard to see why – the Omlet Scrappage Scheme allows you to get £50 towards a shiny new Eglu or Beehaus in eggschange for any wooden pet house or hive . No matter what age or condition, we’ll take it off your hands! We’ve put together a rogues gallery of some of the houses we’ve collected so far and you can click here to see it. 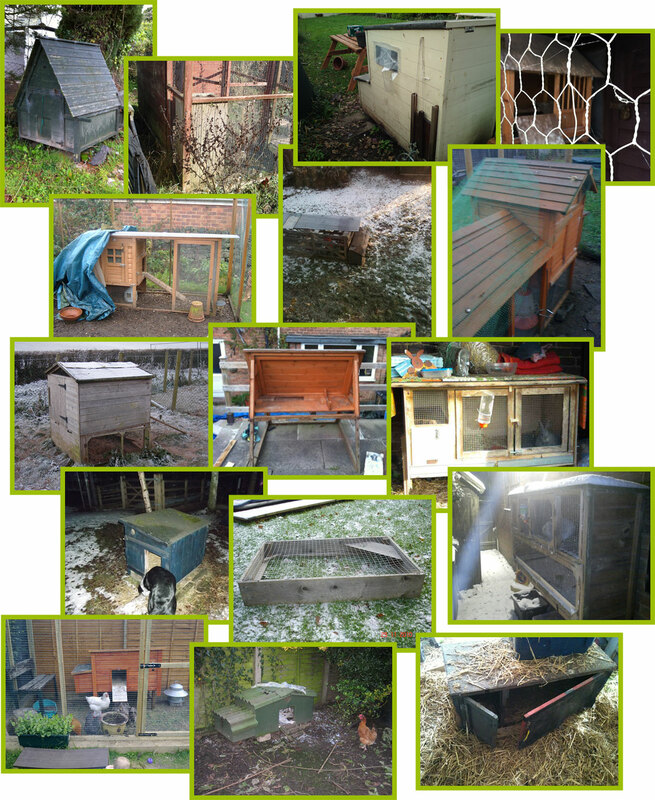 And if after looking at the photos you decide that you, too, would like to get rid of your old wooden hen house or rabbit hutch and replace with a clean and colourful Eglu, you can click here for more details! Harry Potter to Keep Bees? Now that all of the Harry Potter movies have been filmed, Daniel thinks his character should be allowed some peace and quiet after a rather hectic life at Hogwarts. After all, a life of fighting Voldemort can really take it out of you! He had two ideas for Harry – to start bird watching (he is a big fan of owls) or to retire to start keeping bees. Unfortunately Daniel himself isn’t planning on settling down just yet, he’s got a few more years of acting before he plans on getting a Beehaus! If you fancy taking up beekeeping this year click here to read our guide! The best thing about keeping your own chickens is the eggs, and sometimes Eglu owners open the eggport to discover one or two that are out of the ordinary. When Julia visited her hens one morning recently she had a bit of a suprise, finding a tiny egg no bigger than a quail’s egg. It weighed just 4g – not quite big enough for her breakfast. Luckily this was a one-off and the hens went back to laying normally. That is until she found another shocker a few weeks later. This time it was a big egg she found, weighing in at 118g and measuring around 9cm in length. According to the Egg Leaderboard on Omlet Forum neither of Julia’s eggs are record breakers – amazingly the largest egg so far was 170g. However, we wonder if she has set a new record for the biggest difference in eggs from one hen.